Chinatowns are fun places to flaneur in any city. Recently, I found myself near Calgary's Chinatown on a sunny spring afternoon with some time to wander so thought I'd check it out. I am sad to report it was like a ghost town - no street vitality, shops were empty (many vacant) and many of the building were looking very tired. For example The Opulence Centre, with HSBC as its anchor, should be an embarrassment for both the bank and the building owner. Calgary's Chinatown lacks the hustle and bustle, clutter and chatter that is commonly associated with a healthy chinatown. Below are photos of Calgary's Chinatown - the good, the bad and the ugly! Racy dolls found in Dragon City Mall shop window. Flickering spring sun on Chinatown's Golden Happiness Plaza and Bakery. Archway to Chinese Seniors Centre provides a wonderful vista of the Centre Street Bridge and its iconic lions. Chinatown's street vitality includes cars parked on the sidewalk, while street parking spots sit empty and only seniors on the sidewalks. One of Chinatown's many lions, with office tower looming in the background. It looks angry! This fun dragon cut-out that can be found on the railing of Chinatown shop is just one of the many urban surprises. Another dragon adorns the entrance to the indoor Dragon City Mall. Next to the Bow River, this fish wall is yet another surprise. Dragon City Mall has been empty every time in have visited for over a decade. Who knew Calgary's Chinatown has a street art alley? A Chinatown alley waiting for a couple of murals? Super Hero Window in Dragon City Mall. 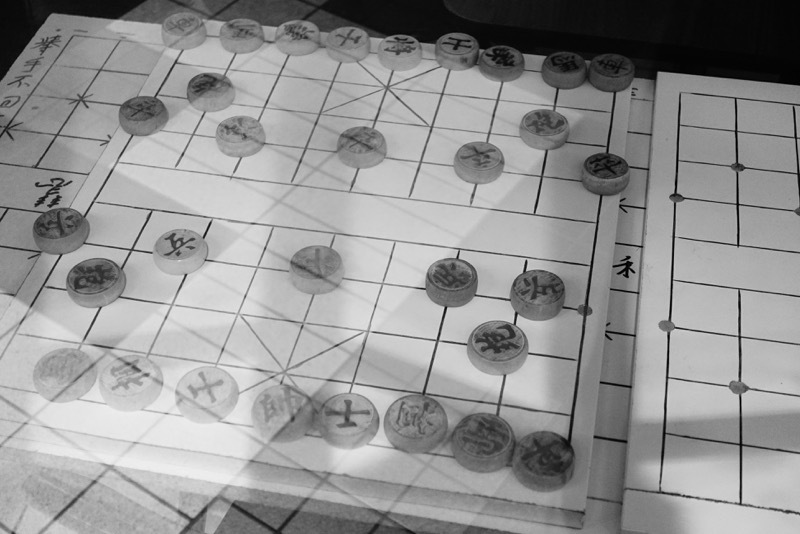 Chinese chess or xiangqi is basically a board game fought between two armies each with sixteen pieces. This one was found in a window in upper floor of Dragon City Mall. Chinese Cultural Centre with downtown office towers looming in the background. It would be a shame to lose Calgary's Chinatown as it has been part of our downtown for over 100 years and has the potential to add so much charm and character next to our central business district. It should also be a vibrant fun urban playground, not only for those living in Chinatown but all of Calgary's City Centre residents.